Several key international standards for laboratories are currently being revised, of which DIN EN ISO/IEC 17025  is probably the most important. This will involve a number of changes for laboratories. Independently of revisions to standards, however, accreditation bodies are also changing/tightening their requirements – with ramifications for accredited laboratories. Accreditation of a laboratory means that an accre­ditation body (in Germany, Deutsche Akkreditierungsstelle GmbH, DAkkS) has verified that the laboratory possesses the competence to conduct certain types of laboratory tests. The exact nature of the tests involved is specified by the scope of the accreditation itself, which is defined by the testing area, testing field and – traditio­nally – by a list of test methods (standards, in-house methods) (see tab. 1). In practice, however, a definitive list of test methods can lead to difficulties, particularly for laboratories that are active in fields experiencing rapid technological change or which regularly handle highly diversified kinds of tests. Accordingly, interested parties in Europe (laboratories, regulators, clients) have acted to allow a certain degree of flexibility. DAkkS permits three separate categories of flexibility in its relevant regulation . In the lowest category, standardized methods are to be applied, whereas the particular version of the standard is not specified. The highest category permits the modification or improvement of existing testing methods or the development of new methods within a specified testing field, without notifying or receiving approval from DAkkS beforehand. In order to characterize the testing fields, these are typically underpinned by a representative number of test methods. In all cases, however, the degree of flexibility granted is strictly conditional on the modified or new test methods not utilizing any measurement principles (type of testing) that differ from those already covered by original definition of the testing field. If the laboratory chooses to apply for a flexible scope for its accreditation, the competence of its personnel will need to comply with more stringent requirements. Methods that have been modified or developed in-house must be validated. To this end, the lab must also establish key method parameters – such as the working range, limits of detection and quantification or measurement uncertainty – and ensure that the method is suitable for its intended purpose. When utilizing standardized procedures, the lab must furnish proof that it possesses verification procedures that are used to verify the professional application of the standard and compliance with the method parameters as stated therein. In legally regulated fields, a flexible scope of accreditation is not always accepted by the regulators responsible for granting approval. Fig. 1 Calibration hierarchy diagram. Traceability requires an unbroken chain of calibrations from the measurement instrument to a reference, typically held by the National Metrology Institute (NMI). To ensure the compatibility of results from measurement and testing, DIN EN ISO/IEC 17025  requires the results to be traceable. A result has metrological (measure­ment) traceability if it “can be related to a reference through a documented unbroken chain of calibrations, each contributing to the measurement uncertainty.”  The reference can be the realization of a measurement unit, a measurement procedure or a measurement standard (see fig. 1). The instruments deployed by an accredited laboratory must therefore be calibrated regularly. This involves comparing the value displayed by the instrument with a value supplied by a measurement standard while determining and documenting the measurement uncertainty associated with this comparison. The standard of proof accepted for measurement traceability as used in accreditation has been established internationally . Recently, DAkkS has again revised its policy in this area . Unconditional acceptance is assured in two cases. 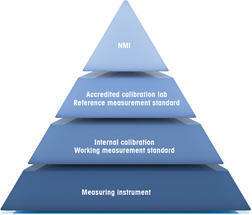 First, for calibration certificates issued by national metrology institutes and “designated institutes” – which in Germany are the National Metro­logy Institute (PTB), the Federal Institute for Materials Research and Testing (BAM), the Federal Environment Agency (UBA), and the Federal Office of Consumer Protection and Food Safety. Second, from accredited calibration laboratories. These calibration activities shall be covered either by the mutual recognition arrangements of the metrology institutes (CIPM-MRA)  or the scope of accreditation. Strict conditions apply to the acceptance of calibration certification not covered by the CIPM-MRA or an accreditation – including works calibration certificates, certificates from verification authorities or reports of in-house calibration (see , Section 6 and annex). Their use is not recommended by DAkkS. As regards in-house calibration, the new policy adopted by DAkkS is likely to be unproblematic only for methods requiring calibration – as is the case frequently with chemical analysis. 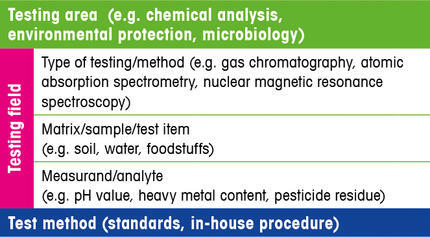 In such cases, the calibration process is part of the analysis procedure and is included in the assessment. We see problems arising if the lab performs in-house calibration of instruments (e.g. balances, pipettes, thermometers, etc.) independently of specific procedures, however. The conditions outlined above are so restrictive here that this kind of approach is often not worth the effort when compared to external calibration by an accredited calibration laboratory. The lab decides on the frequency of instrument calibration itself, based on its own experience, although this decision is naturally also assessed by DAkkS. Here, DAkkS only issues a set of guidelines (see e.g. ). The measures stated in DIN EN ISO/IEC 17025  for ensuring the quality of test results also include proficiency testing and interlaboratory comparisons. Interlaboratory comparisons involve two or more laboratories taking ­measurements from/performing tests on the same or similar test items and then comparing their results with one another. Proficiency testing involves specialized interlaboratory testing offered by proficiency testing providers so as to assess the proficiency of participating laboratories (see fig. 2). Their results are utilized by accreditation bodies to establish competence. In accordance with the relevant DAkkS regulation , laboratories must subdivide the scope of their accreditation into “sub-disciplines”. A sub-discipline consists either of one testing field or possibly multiple testing fields (see tab. 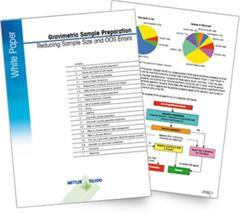 1), in cases where the results of profi­ciency testing can also be considered representative for other testing fields. This is especially the case if an identical test method is used in these testing fields. Insofar as proficiency testing is available and both technically and economically appropriate, DAkkS requires accredited laboratories to have participated successfully in at least one proficiency test per sub-discipline within an accreditation period. Proof of successful participation in proficiency testing representative for the accreditation scope applied for is required before initial accreditation. This includes participation in proficiency testing that is mandatory for state-regulated approvals and licenses (e.g. as mandated by drinking water legislation). Details of proficiency testing schemes can be found by consulting the EPTIS database . If no proficiency tests have been scheduled, labs should investigate the possibility of organizing interlaboratory comparisons themselves. 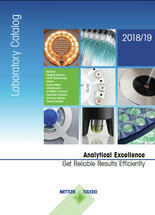 Interlaboratory comparisons performed for method validation or to characterize reference materials can also be used as proof of competence, for example. An accredited laboratory should first define a proficiency testing policy that describes the lab’s fundamental approach to proficiency testing. This must be complemented by a plan (extending over at least three years) stating the proficiency tests in which the lab will participate. Records (including the test results achieved), must be kept for proficiency tests in which the laboratory has participated over the last two years. These records are submitted during assessments. If participation in a proficiency test is unsuccessful, this does not automatically have consequences in terms of accreditation. In such a context, the first step is to assess the corrective actions taken by the laboratory to safeguard the future quality of its testing and/or to correct erroneous results obtained in the past. As of this writing, not only is the all-important laboratory standard DIN EN ISO/IEC 17025  undergoing revision but also DIN EN ISO/IEC 17011 , for example, which defines the requirements for accreditation bodies. This may also indirectly affect organizations requiring accreditation, whether in terms of participation in proficiency testing (see above), the frequency of surveillance visits or the reporting of measurement uncertainty. The essential guideline for the determination and specification of measurement uncertainty  is also being revised, which is likely to result in major changes for laboratories. DAkkS has recently announced its intention to revoke the time limitation for accreditation validity, which is currently set at five years. This will also be accompanied by changes to the surveillance periods. These changes will enter into force only once the Federal Ministry for Economic Affairs and Energy has issued a new scale of charges and fees for DAkkS, however. So, from a laboratory perspective, can these changes to accreditation requirements be seen as improvements? Certainly – to an extent. The possibility of agreeing in a flexible scope for accreditation – which DAkkS now offers not just to testing laboratories but also to product certification bodies and (with certain limitations) to calibration laboratories – meets the requirements of the stakeholders affected. Laboratories are also likely to welcome the abolishment of accreditation periods. It’s not yet possible to state whether the associated changes in surveillance will result in real savings compared to current practice. 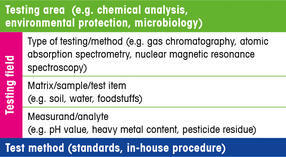 Other changes, such as the more restrictive requirements in relation to measurement traceability or participation in proficiency testing, go beyond the requirements of the relevant standard  in its current version while having the effect of increasing laboratories’ workload and limiting their choice of options. A growing trend is observed to force accredited laboratories to make use only of accredited service provision – which in the future may apply not only to the contracted calibration laboratories but also to providers of proficiency testing or the manufacturers of reference materials. This is one especially critical development from a laboratory perspective. First publication: Golze, M., Hedrich, M., q&more, 2.2015.